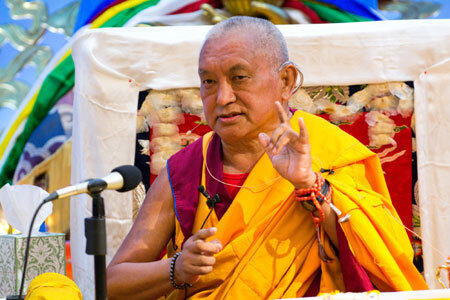 Because the pure wisdom of the omniscient mind, the dharmakaya, is bound by infinite compassion for living beings, it manifested in various aspects to eliminate different obstacles of living beings. Such deities as the seven Medicine Buddhas manifested in order to pacify the obstacles to the achievement of even temporary happiness, and especially the ultimate happiness of full enlightenment. When someone is seriously ill, elaborate meditation practices containing the dedicated purposes of each of the Medicine Buddhas are done. It is commonly found that this puja decides whether the person lives or dies. They either recover immediately or die within one or two days with a peaceful mind rather than living with a lot of pain. Medicine Buddha practice is very powerful. While the Medicine Buddha puja is very effective in cases of serious illness, it is also performed to bring success generally. It is good to do a Medicine Buddha retreat for one or two months. By practicing these methods, we can gain clairvoyance. A sign of attainment is that patients come to you in your dreams and you diagnose their illness; the next day they actually do come to see you and you can prescribe the exact treatment they need. Another sign is that when you concentrate on the patient’s pulse, you can immediately recognize the disease and prescribe the correct treatment. Also, as you are examining the pulse, many goddesses may appear in space around you and tell you the nature of the disease and its treatment. Because of the flourishing of the five degenerations, the diagnosis of sickness has changed and new disease patterns have emerged. Doctors have difficulty in recognizing the new diseases and do not know the treatment. These patterns are just as Padmasambhava predicted. In the presence of the eight Medicine Buddhas – when we refer to eight, we are including Shakyamuni Buddha – Manjushri requested, “As you have promised in the past, please grant a special mantra to bring success quickly to sentient beings of the degenerate time, who have little merit and who are overwhelmed by many sufferings, including diseases and spirit harms. May these sentient beings see all the Buddhas and accomplish all their wishes.” Together in one voice the eight Medicine Buddhas granted the mantra in response to Manjushri’s request.